Rising up out of the granite hills of the Glen Innes district, in the vicinity of megalithic stone arrangements that lie scattered about the countryside, is a kilometre or so length ‘tabletop’ hill. Carved into a large boulder at one end is a strange symbol; a human-bodied, winged, bird-headed figure. 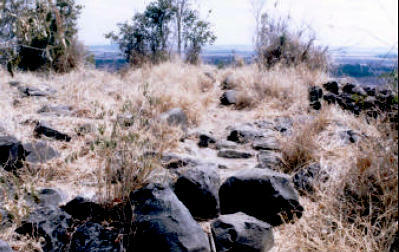 Similar winged, human-bodied figures, are commonplace at open flat-summited hills lying among the old terraced Uruan structures standing south-west of Sydney, in the Campbelltown district [see Chapter Three], and upon clifftops and high, tabletop areas throughout the nearby Blue Mountains. They occur upon tabletop-summited hills and mountains across the Australian continent, including Tasmania. Birdman flights. Photo copyright © Rex Gilroy 2004.un. Photo © Rex Gilroy 2004. They are images of the ‘Birdmen’ of Uru, the first humans to begin the conquest of the skies. Some Blue Mountains rock art shows there were ‘birdwomen’ too. These rock engravings show that over 15,000 years ago, employing the simplest materials, the Blue Mountains Uru had taken to the air in the earliest hang gliders built on earth. In imitation of the flight of I-na, the Eagle of the Sun, at the height of ceremonies in his honour, held at cliff, hill and mountaintop temples and shrines dedicated to him, men boldly leapt into the air, to glide over valleys and open plains. One ancient ‘runway’ at Katoomba discovered by the author, contains engraved human male and female figures clothed in ceremonial garments arranged in dancing poses, together with a ‘birdman’ as if about to take flight. Hopefully his ‘wings’ held him aloft successfully, for he was about to leap from a 166m high cliff! 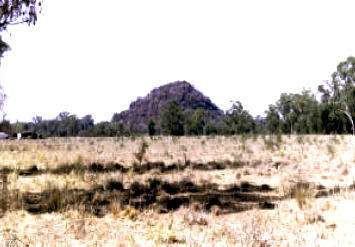 A similar launching site exists upon Mt Scoria, a pyramid-shaped volcanic plug situated inland from Queensland’s mid-north coast. Rising 150m high, the base of this ryolite rubble formation measures 500m in length on each side. “On the day of measurement, on midwinter’s day three Birdmen fly here”. This natural formation, which dominates an otherwise flat, featureless landscape, had in ages past been modified and utilised by the Uru for astronomical purposes. The birdman inscription would suggest this cult was very strong in this area. This pyramid-observatory will be dealt with at further length in Chapter Fifteen. Aborigines of the Murinbata tribe, of the Port Keats district north of the Fitzmaurice River Northern Territory referred to the “Brolga Men”, who leapt into the air from high places and flew from billabong to billabong, for they found it easier to fly than walk to these water holes! The Murinbata people preserve traditions concerning the “great flood” that once covered the land, and how the Birdmen escaped it by flying to higher ground where they remained until the waters receded. Huge boulders that stand about the countryside hereabouts - often inapparent formations were, tribespeople believe, originally parts of great rock walls built to keep the floodwaters away! This tradition has to be of considerable antiquity, for it describes the flooding caused by the rising seas towards the close of the last great Ice Age, around 12,000 years ago. One particular clan of these winged warriors of Uru were called the “Eagle Men”. They inhabited the Fitzmaurice area, as well as the Daly River further north, and were claimed to have introduced fire for cooking among the primitive ancestors of the present-day tribes of the region, who in those long-ago times did not possess this art. engravings found near Katoomba NSW. Similar traditions of “Birdmen” introducing fire, as well as other technology to the tribespeople occur Australia wide, wherever weathering megalithic stone arrangements stand. Surely there had to have been many ‘birdpeople’ who came to grief as the Uru took humankind’s first brave steps that would, thousands of years in the future, culminate in Neil Armstrong’s first footstep on the surface of Ara. ‘Birdman’ mythology is world wide and widespread in ancient Australian Aboriginal folklore. For example, Aboriginal mythology of Central Australia speaks of the “Kung Kung”, described as “a tribe of cruel men” who lived in a huge cave deep in a remote region of the “Red Centre”. The Kung Kung fashioned wings which they attached to their arms, enabling them to fly like birds. They would fly about the landscape, watching below for wandering Aborigines, upon whom they would descend and attack, tying them up and flying them back to their cave, where they threw their victims into a pit of fire. The Kung Kung men were otherwise said to be handsome, pale-skinned warriors and their women very beautiful. They were always happy, holding ceremonies at which they performed dances, including a ‘sacred Emu’ dance. It is apparent that these Kung Kung were not Aborigines but Uruans. In the Ayers Rock [Uluru] region they were called the “Eagle Men”. The Kung Kung ruled the skies of the Flinders Ranges, fabled domain of King Ja-wa [pronounced Ya-[h]we[h] in Uruan tongue], whose name was known far beyond this great natural citadel [see Chapter Two]. The names of the Uruan Birdmen differed from tribe to tribe throughout Northern and Central Australia. They are said to have painted themselves in ochre colour designs symbolising particular bird species, and individual Birdman cult clans appear to have identified themselves with a single species, the eagle being the most preferred. The Aboriginal tribes of the Fitsmaurice River, of the lower west coastal Arnhem Land district, also referred to these winged warriors as “Flying Fox Men”, describing them as a distinct race to the Aborigines, because of their fairer skin colour to that of the tribespeople. It is said that the appearance of these flying men in the air overhead was enough to make the Aborigines flee their fishing grounds, upon which these beings descended to steal fish. Between the Fitsmaurice and the Victoria River further south are the hunting grounds of the Aliura, Naliwuru and Mariu; tribal names containing variations of the word Uru, a feature common to the many other tribes of Arnhem Land, as well as over a vast area of the Northern Territory, Western and South Australia, wherever traces of the Uruan Bird-man cult occur. In the Buckingham Bay region of north-eastern Arnhem Land, the Kuppapoingo tribespeople preserve myths of Kunji, the “Jabiroo Man” [symbolic of a whole people] who besides possessing the power of flight, caught fish with large stone traps, or with spears far better than those made by the tribespeople. After feasting upon their catches he would leap into the air and fly to the sky-world, only to return later for more fish or hunt other game in the scrublands. When on the ground ‘he’ lived among rocks [ie stone structures?]. Throughout the Macdonnell Ranges eastwards to the Hale River and southwards to Charlotte Waters just inside the South Australian border, the Aranda tribespeople’s mythology preserves tales of the “Eagle-Men”, who leapt into the air from mountain tops, including the Olgas and Ayers Rock. They ruled the skies, driving out whole tribes by swooping down, weapons in hand, attacking individuals or whole groups of Aborigines, often whistling and shouting down at their prey as they descended to the attack. However, Aranda warriors eventually began repelling these attacks, hurling their boomerangs and spears at the Eagle Men, many of whom were killed, until they flew away never to return. During our July 1999 field trip to Central Australia, Heather and I gathered a considerable amount of archaeological evidence of former Uruan presence throughout this region; in the form of rock inscriptions, megalithic stone arrangements and structures. These structures stand in areas in which, according to local mythology, the Eagle-Men once dwelt.